The money math games in Zapzapmath, such as Counting Money, allow players to have a fun and enjoyable time while learning about counting the values of coins and banknotes. Your journey in and around the Zapzapmath ecosystem has been very enjoyable thus far, but you are missing your family. To show them that you are thinking of them, you take a break from all that training to head out and score some thoughtful souvenirs at the local gift store! The gift store has such a wide range of cool items that you can purchase for your family. With cash in hand and gift ideas to inspire, you start filling up your shopping cart! What a fun and easy duty it is to choose lovely gifts for your loved ones! However, you completely underestimated the task of making the right payment for your purchases. It seems the cashier can only accept the exact amount for each item, otherwise he will not ring up your sale. This means you need to put your addition skills to good use, and measure up the right amounts required to complete your purchases. First, you need to address the total amount shown on the cash register. Then you start calculating exactly how many notes and coins of different denominations you will need to hand to the cashier. Your wallet will include $5 and $1 notes, along with coins ranging between 50 cents to 1 cent. To give the cashier the right quantity, start by measuring exactly which notes or coins you will need to add up to the total amount. For instance, if your total amount adds up to $1.54, you need to provide the cashier with one $1 note, one 50-cent coin, and four 1-cent coins. Once you have established the breakdown of cash that you need to hand over to the cashier, tap on the notes or coins to add them up. When the total arrives at the exact amount you need, tap on the submit button to enter that amount. The right amount will have the cashier wrapping your gift up into a perfectly packaged result, whereas the wrong amount will have the cashier taking your gift away! Do not panic, you have plenty of chances to get these gifts right! Our game teaches how to recognize money and add them up based on their individual denominations. 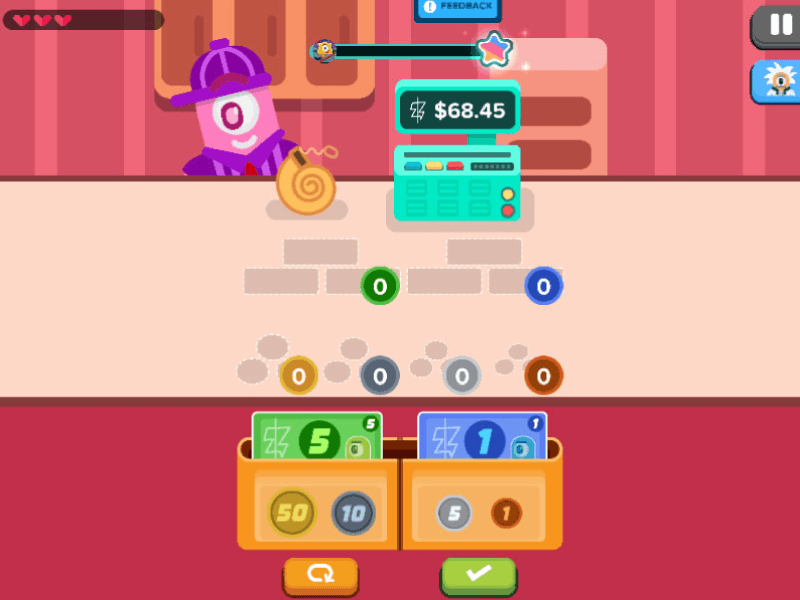 Money math games allow players to learn the monetary values of notes and coins and how they can be used to sum up a total amount through the enjoyable practice of purchasing items. They introduce the breakdown of cash combinations and their total values. Players of money math games establish good training of quantities and measurements. The amounts get bigger as you progress through the game, so consistent practice and careful consideration of your cash calculations will result in great purchases! Money is the key to winning this game!